Baselworld 2013 was definitely all about the statistics! From the new look venue to sales, attendance and exhibitors, all eyes were on how the 41st annual show would hold up in such tough economic circumstances. This year was packed with big anniversaries and exclusive collections, and the numbers speak for themselves, so here’s the ultimate round-up of the hottest Baselworld 2o13 stats! One of the biggest talking points about 2013’s show was the new venue, so it’s no wonder that all eyes were on the unveiling. World-famous architects Herzog and de Meuron designed the new hall complex, which contains over 1000 exhibitor stands arranged around various halls. The new venue took an amazing five years of planning, and took just over 22 months to build. Over 6,800 tons of steel and 450,000 square meters of concrete hold everything in place, and the venue cost over 400 million Swiss francs to build. Wow. The new venue seems to have paid off, with the eight-day show being a record success. Baselworld 2013 broke a new record, welcoming over 122,000 visitors from over 100 countries, a 17% increase on 2012’s attendance. Exhibitor numbers also grew, with a total of 1460 attending over the eight days, and showcasing their collections and innovations. Despite the new lay-out, which some described as confusing, exhibitors seemed to find the show a big success too. Considering the slow trend of the European jewelry market at the moment, the show did excellently, and garnered huge coverage of exhibitors. 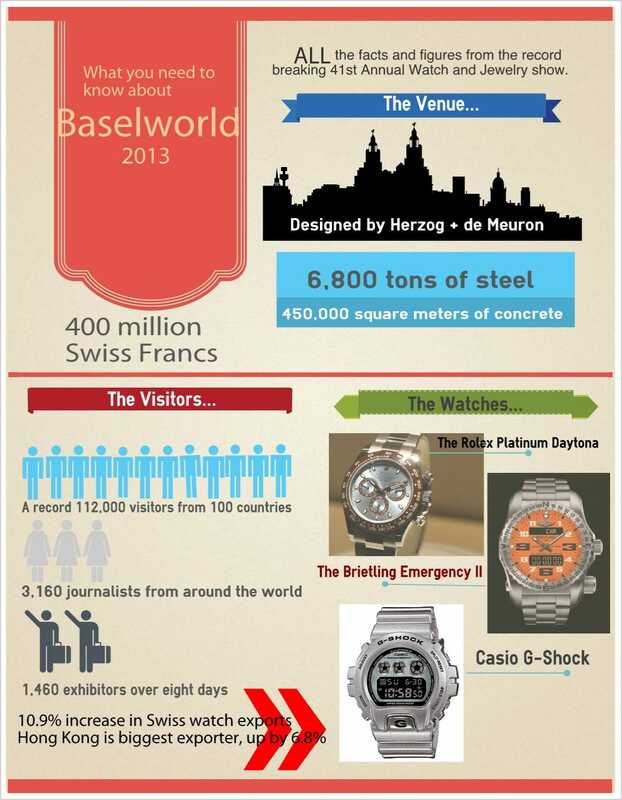 Baselworld 2013 also hosted 3,610 journalists across the event, from publications around the world. That’s a 9% increase on 2012’s numbers! Francois Thiebaud, the president of the Swiss Exhibitors Committee and the CEO of Tissot, announced a 10.9% increase in Swiss watch exports this year, rising to a total of CFH 21.4 billion. The Chinese market seems to have shrank more than expected, showing only a 0.6% increase. Industry experts explained this by stating that many Chinese buyers purchase while travelling, to avoid expensive taxes. Others claim that the Chinese Government’s clampdown on corruption and bribery has damaged the market, with Swiss watches being common gifts to officials. Hong Kong, which is ranked separately to China, retained it’s title as the biggest Swiss watch customer, importing CHF 4.3 billion of watches: a 6.8% increase. Gemstones were a big trend throughout the show, and buyers didn’t seem to manage the higher prices for gemstoned jewelry or watches. Loose diamonds were another popular trend, although exhibitors reported needing to negotiate much harder on prices for diamonds. Jewelry sales in general grew, as expected. The Indian Pavillion also saw a big boost in sales, due to now being located in Hall Two, alongside the biggest watch brands. Swarovski announced it’s 2020 Vision brand development program, including aims to purchase a number of established jewelry brands. Swarovski has now announced that it has acquired US brand Chamilia. 129-year-old Swiss watchmaker Breitling released another of it’s celebrated high-tech watches, and the Emergency II, which comes in volcano black, cobra yellow or intrepid orange, is already said to be bigger than the iWatch. Back in 1995, the Emergency I was created with a single-frequency distress beacon built in. More than 40,000 watches were sold, and Brietling records show that the watch saved at least 20 people, from plane crash vinctims to car wrecks and military firefights. The Emergency II is a 10-layer, indestructible wrist chronometer, with a dual-frequency distress beacon micro-transmitter. Hublot caused a stir by unveiling the striking MP-05 LaFerrari, a striking open-dial and sapphire crystal watch with a manually wound movement. The watch contains 657 parts, more parts than any other Hublot watch, and has 50 days of power reserve. It’s designed to match the stunning Ferrari hybrid car unveiled earlier this year. All the big rumors before Baselworld 2013 surrounded Rolex, and they didn’t disappear. The Rolex Platinum Daytona was released to celebrate Daytona’s 50th birthday, and this striking 40mm wide watch has a brand new 950 platinum case and bracelet. The blue dial and brown cerachrom bezel were right on trend, too. Casio G-Shock celebrated it’s 30th birthday by releasing an anniversary edition, in a limited run. The 5000 DW-6900 model comes in a lustrous silver, and has a mirror front and sides, a brushed metal dial and an engraved back plate. It’s a very modern update for this timeless watch! “This stand reflects our brand in an outstanding manner. We were able to welcome around 800 journalists. The number of buyers has also risen. This show is an event not to be missed.” Luc Perramond, CEO of La Montre Hermes. “Baselworld 2013 was an exceptional platform for us, allowing us to meet customers and the media. Thanks to our new ‘wings of sparkle’ stand concept, we attracted a large number of visitors, and a high level of attention from the media from all over the world.” Robert Buchbauer, CEO of Swarvoski. “We invested a great deal in new models and our stand, and our customers are delighted. We were also able to acquire considerably more new customers compared with previous years – especially from Russia and the Far East.” Giuseppe Picchiotti, owner of Picchiotti. Baselworld 2014 will take place between March 27th and April 3rd next year, and judging by this years’ stats, it’s definitely worth marking it in your diary now.